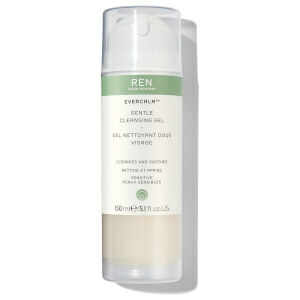 REN designed its Rose Centifolia Cleansing Gel (150ml) to provide a unique experience: thorough and complete removal of make-up, dirt and grime with a product that feels as gentle as water. The paraben, sulphate and petrochemical-free formula, infused with centifolia rose petals and aloe vera, balances, tones, smooths, softens and soothes skin. Polyphenols from the rose petals protect the skin from free-radicals by reducing oxidative damage. You will be left with skin that feels as beautiful on the inside as it does to the touch. Directions for use: Rub REN Rose Centifolia Cleansing Gel (150ml) gently between your hands, then massage deeply into the skin on your face using circular motions. Rinse off using warm water. I've been using this cleanser for 2 weeks and I can say nothing. Nothing good but also nothing bad about this cleanser. It's just okay. But what I can say for sure - I hate texture because it's so liquid and I always think twice how much cleanser do I need. Its smell (herbal) is also very strange and for some people it would be a problem. If you have acne-prone skin it's definitely not for you. For my oily (somewhere problem) skin it does nothing bad and good. I won't buy it again because of its texture because it feels like a jelly on my face. I have very dehydrated skin so I know I cant go wrong with rose for a start.I always found REN to be on the a bit pricey side so I bought it anyway.I must say it cleans well,it doesnt dry my skin at all,it's just so gentle but efficiant. I do really care for clean and organic product in a real sense.Not just claiming so this one is. It smells really great! And i love it! its so great for me, and smells so good, i like it very much.REN ROSE CENTIFOLIA CLEANSING GEL is a natural organic facial cleansing gel .It's very gentle and almost no bubble of state, but they will not feel oily.The skin ,after washing , is very comfortable, soft.Wash a face with light rose fragrance, make into a kind of enjoyment. Because pregnant so bought this so-called pregnant women can also use cleansing gel. Because every day I will apply sunscreen and foundation, so the need for cleansing, the cleansing gel pressing out a good ductility, can easily painted the whole face. But generally require cosmetic cotton or towel wipe with cleansing, can will makeup removed during pregnancy will continue to use.But the baby after birth may abandon the cleanser, or for the morning cleansing. All in all this is a good cleansing gel. Especially in the discount period buy very cost-effective.